There is no denying that the job market today is more difficult to enter than it has been for years. The level of competition for positions, especially executive roles, is incredibly high. The key to a successful job search is to stand out from the other applicants, although this is easier said than done. Your resume is your best tool for catching the attention of CEOs and demonstrating that you are the right executive for the position. To make sure your resume is effective and strong, you should find executive resume templates to help your writing. These guides make it much easier to meet all the expectations employers have for your resume. Why Use Executive Resume Templates? There is little room for divergence in the executive world. Most companies are looking to hire an executive who is a sure thing and will not take unnecessary risks. A traditional resume conveys your understanding of the age-old executive strategies and techniques that have run successful businesses for decades. 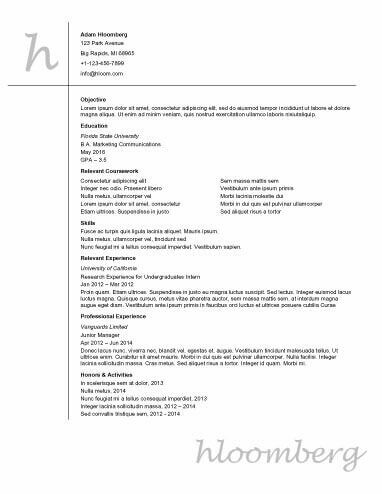 Find relevant traditional resume templates that will help you create this kind of resume. Most resumes should only be one page long, but jobseekers with extensive work history should write more. For executives, it is nearly guaranteed that your resume should be at least two pages. You should usually make the jump to a second page once you have 10 years of work experience. Two-page executive resume templates show how to do this effectively. Executive positions are the highest in any given company. This means that it is rare for an opening not to require a graduate degree. Look for executive resume templates that focus on new graduates looking to jump right into the executive world, and learn the best way to leverage your graduate degree into a lifelong career. One of the most important qualities that you should be striving to demonstrate with your resume is professionalism. This is especially true for executive positions. Executives are the highest managers, so they must be professional and in control at all times. Check out these resume examples to find a professional resume template that suits your specific needs. It is common for executives to jump from one company to another. This can involve changing fields, and to a certain extent, changing careers. Additionally, accomplishing this takes a very specific set of skills and qualities. You can create a resume that shows your ability to change from one field to another seamlessly, jumping right in immediately. Use these executive resume templates to communicate this about yourself. A resume is only as good as the content in it. While correct formatting can help ensure that employers read it, the document will not impress them if it does not contain exemplary skills, qualifications, experience, and professional attributes. The executive resume templates and this guide can help you understand how to create a strong resume. You should put your contact information at the top of your resume. Keep the contact information brief so it does not distract from the rest of your document. The readers should not even notice it until they decide to contact you. Include your full name, a professional email, your mailing address or city, and your phone number. The summary should include aspects from the entire resume. Mention your skills and work experience briefly. Aim for your summary to be three sentences long. Do not describe your objectives in your summary. This was once standard, but it is no longer expected. Write your summary with the intention of hooking the readers and encouraging them to continue reading. Include four to eight skills in a short bulleted list. Each bullet point should be a single word or short phrase. Review the job description and target all skills to each job specifically. Only mention skills that relate to the position you are applying for directly. The work experience section should be the longest and densest section in your resume. List your previous jobs in reverse chronological order, and include a short descriptive bullet list for each. Your current position should be in present tense and all others should be in past tense. Choose a powerful action verb to begin every bullet point. This verb should reflect the actions you took when working that job. Aim to have at least three positions with at least five bullet points for each. It is acceptable to have fewer bullet points for less important jobs. The education section should be brief and appear at the end of your resume. You only need to list your school, degree, and date of graduation. For executive positions, it is likely unnecessary to mention internships or other minor work experiences. Do not include your GPA unless employers ask for it specifically.